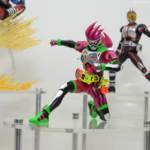 In case you were among those that missed out on the S.H.Figuarts version of these characters, we may have an alternative for you with FigureRise Standard Kamen Rider Zi-O And Kamen Rider Geiz having just been revealed. Rejoice! For the heir of all Riders is here in model kit form. 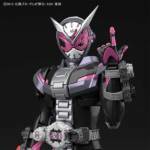 Both Riders will include alternate hand assortments along with their personal sidearms: Geiz with his Zikan Zax and Zi-O Zikan Grade, with the gun and bow modes being included for both weapons though it is unknown if the weapons themselves will be able to transform or not. 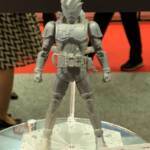 FigureRise Standard Kamen Rider Zi-O and Kamen Rider Geiz are expected to come out March 2019. 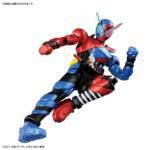 No pricing was announced at the time of this writing, though if last year’s Kamen Rider Build kit was anything to by, we can expect a price point in the 3,240 yen range. 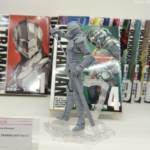 While Toy Fair continues, over in the East it’s time for Winter Wonder Festival and we have our first bit of news with Kamen Rider making the jump into Bandai’s Figure Rise Standard model kit series. 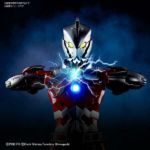 For those of you who may not be familiar with the Figure Rise Standard line; it’s Bandai’s line of model kits which operates at the 1/8th scale. 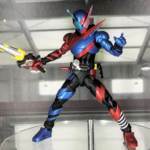 Up until now, the line mostly consisted of characters from Dragon Ball and other anime but now it’s adding Kamen Rider into the mix with a Figure Rise Standard Kamen Rider Build Tank Rabbit Form having been spotted on display. Currently, not much else is known about this kit other than the fact that it’ll have an assortment of hands and Drill Crusher weapon, this should provide a decent enough substitute or alternative for those that may have missed out on his S.H.Figuarts release.